Entering our house from the garage, you come into a small hallway (or mudroom), which leads to the laundry room, kitchen, and a half bath. When we first toured the house, we noticed these bright orange stickers over everything that used water. The house had been winterized, and vacant for at least nine months. 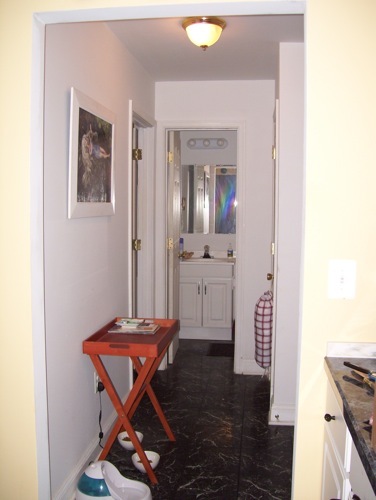 In this picture, the half bath is at the far end. (It’s the only pre-moving picture I could find). We lived with the primed only walls for nearly a year, when I decided I wanted to try something bold and colorful. Ah, so many things that could be upgraded and changed…so little money. We were hurting for cash, so other than paint, everything was stuff I already bought, inherited, or was given. I chose two shades of the same tone of blue- I think I remember Bahama Blue being one of them. 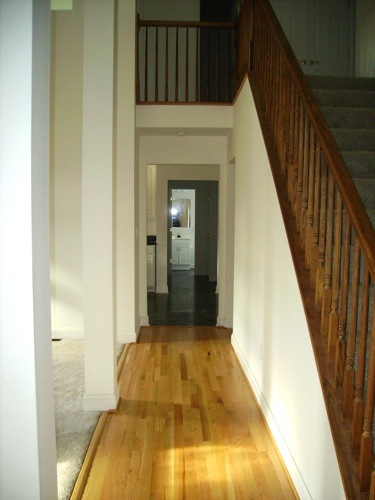 The hallway is darker, with the lighter shade in the bathroom. The floating shelf I had from ikea, and I stabilized it with a bracket from Home Depot. The tin jar has a cloisonee effect and belonged to my father’s mother. A little dish holds keys and change, and a pumpkin for October. 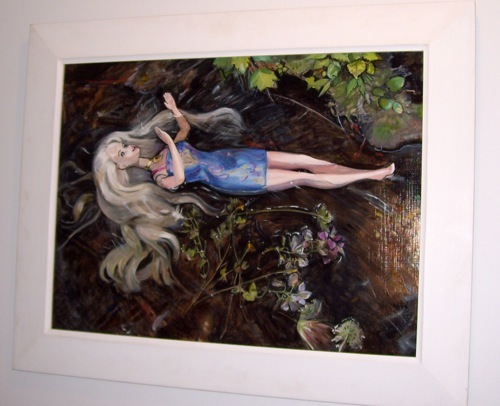 The painting is by my very talented co-worker, and is of Barbie as Ophelia. She had it in storage, and is very graciously allowing me to hang it in my hallway. 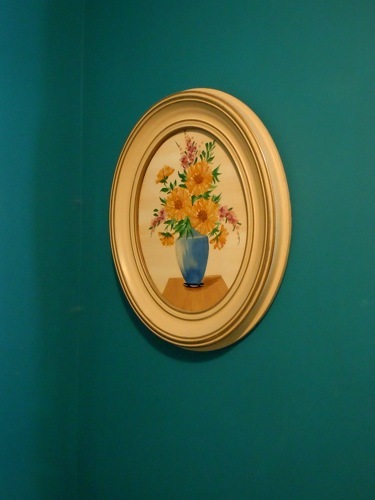 The other painting in the hallway, on the opposite wall, is a little floral stiff life, also inherited. I thought it would look cute with the turquoise color behind it, and no one else really wanted it. 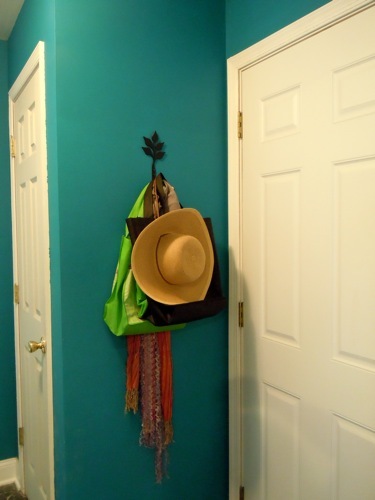 There’s also a hook for scarves and hats, and grocery bags. I bought the hook when I was living in Lexington, VA. I do have two kitties, so this is their bathroom too. The striped rug is one of those squishy mats that helps hold cat litter. It works great! Just a detail of the little bowl on the sink. 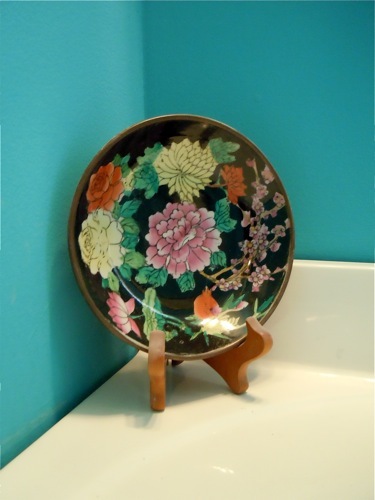 This was also my grandmother’s, and I love the slightly asian vibe. (I think it has a sticker on the back about being made in china.) The color I chose is a popular color from the later 19th, early 20th century, and reminds me a little bit of the color from the Peacock Room by Whistler. Artists were intrigued by the east at this time period, and there was a resurgence in Asian inspired pieces in furniture, textiles, and art. 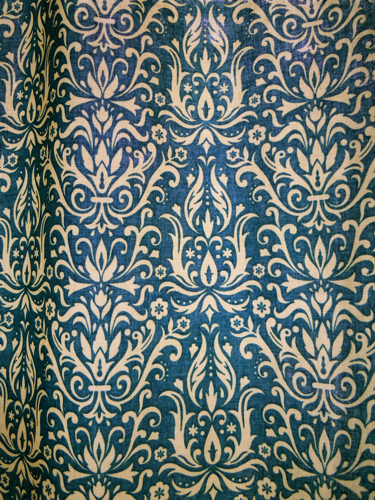 This is partly why I chose this fabric for the curtain. I made this small curtain panel and posted about it here. The print I bought several years ago at my great-aunt’s estate auction. I re-matted and re-framed it equally as long ago. It is actually a watercolor painting on mat board. I like it’s simplicity and vintage vibe. So that’s pretty much it. I have some ideas of some other projects I’d like to tackle– such as changing the light fixture(s) and faucet. If we really had any money, we might upgrade the flooring to tile. The progress I’ve made on the half bath, so far. To be continued…? These curtain panels are so simple to make, I did not bother with any “during the process” pictures. 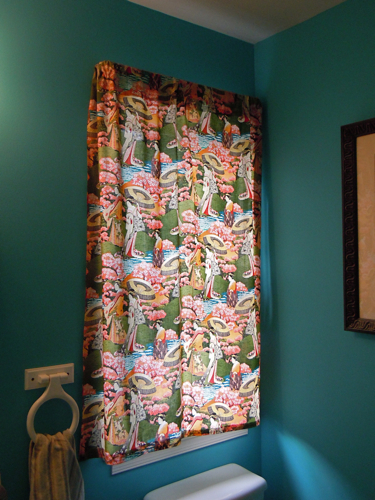 Also, I was in a rush when I made the curtain for the half bath about a year ago. On the “south” side of the house, I have a laundry room and half bath that are off the “mud hallway” entrance from the garage. 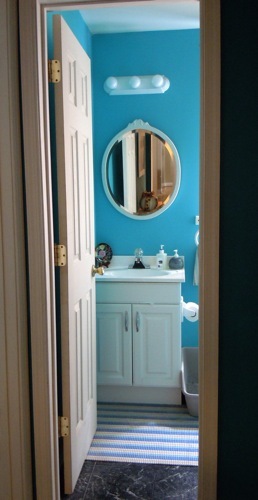 I painted the hallway and bath two shades of the same blue. 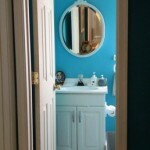 I believe, it’s Caribbean blue by Benjamin Moore. It does make the space a bit darker, but I love the richness of the hue. The half bath and laundry room each has one little window, overlooking the driveway and a tree line. I’m not really worried about privacy here, but I did want the bathroom to have some privacy in case of visitors. And, since we were getting married and having a bunch of people over for a bbq rehearsal dinner, I thought it might be time. So the day before people started showing up, I quickly sewed this panel and put it up with a simple standard curtain rod. I decided to use a simple (and cheap) rod because I knew it was not important for this curtain to ever be open. Also, there is so little space between the window and the wall that I’m not sure a decorative rod would have fit. If anything I may have had to leave off one finial to make it work, and I thought that would look cheesy. So! 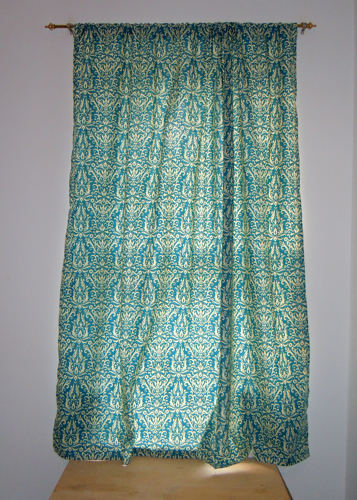 To make this curtain, I took about a yard and a half of fabric (I originally bought two yards of 45″ wide fabric), and pinned and ironed the edges, and then sewed them down. I folded about four inches over the top to make the pocket, and sewed it. But, you don’t usually need a pocket quite this big. Next, I measured the window from where I wanted the curtain to hang, and I transferred that size to my curtain and hemmed. For me, sewing is really easy (straight line across). But, I know lots of other people like to use hem tape. It works just as well and only requires an iron. The blue in the fabric is an exact match to the color on the walls. I was lucky that it happened that way, but I loved his pattern anyway and would have used it regardless. The deep turqouise color reminds me of the Peacock room (at one of my favorite galleries), and I wanted to get a Chinoiserie vibe. 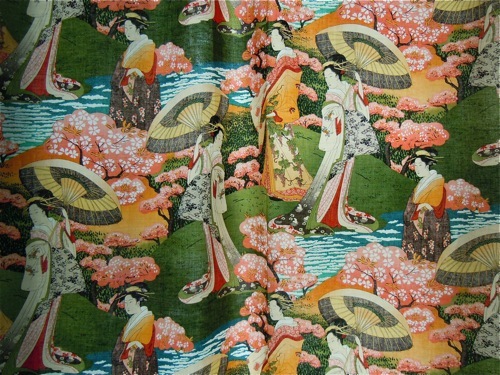 While shopping a huge sale at Joann’s over Independence Day weekend, I found this fabric that I just really loved. Originally, I was meaning to make an apron out of it. 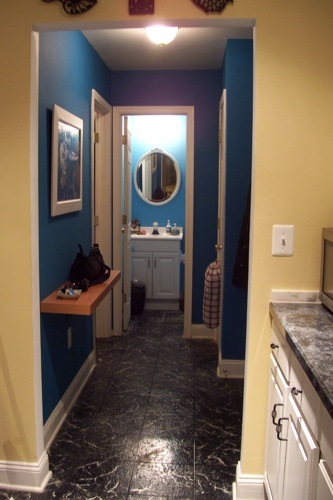 But after I got home, I realized it has the same colors as my hallway and kitchen! Hmm…if only there was someplace I could put it…aha! The laundry room. I had completely forgotten, and neglected this room since we’ve moved in. The only upgrade it has ever gotten was to replace the appliances. I haven’t even painted the room yet. However, there was a pair of curtains up, left by some previous owner. They were hideous, but I just sort of draped them up on themselves to let in light. 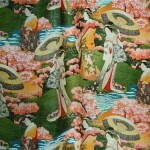 But now, I had a fabric that would compliment the nearby rooms. I purchased a yard and a half which was just enough to make this curtain. 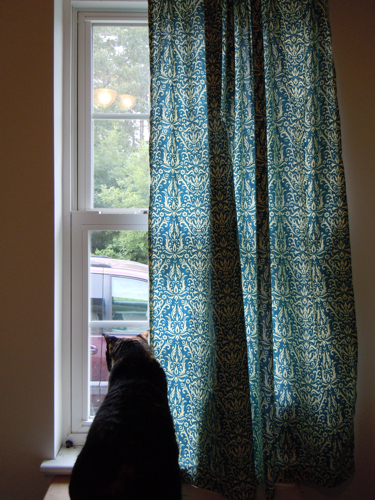 I did the same thing as I did with the other curtain, except I made the pocket just big enough to accommodate the rod. It wasn’t until I was taking the old curtains down that I realized there was a nice little brass rod. 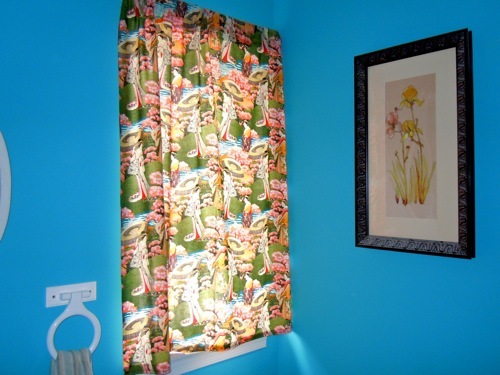 Thankfully, the fabric was just the right length with everything finished, and it brings a pop of color into the room. Someday, I will share more pictures of the laundry room when I have a chance to make it pretty, but right now it’s too ugly. really. She even got on the toilet and stuck her head under the curtain in the bathroom while I was trying to take pictures. But she just rubs up on me and starts purring, how can I not love her. I can’t believe how long it took me to make a new curtain for this space. 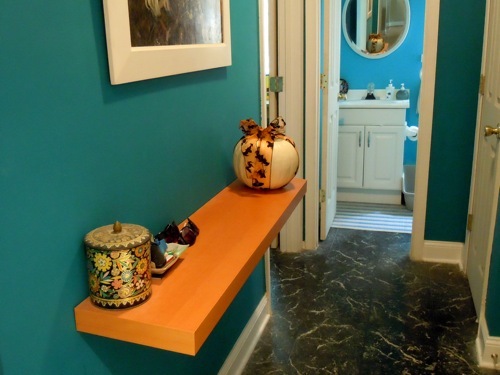 It’s such an easy fix to personalize the space a bit more, and help it tie in to the rest of the house. Maybe it will get me motivated to paint this room and put in actual baseboard (right now, it’s what the builder originally put in, window and door moulding).